A set of tools to aid in the daily VRay work. Updated to install with Max 2014. WARNING: there is NO guarantee than any of the tools will work as intended, that they won't break your scenes in dramatic fashion, or skin your cat while you aren't looking. This update comes purely because i needed the Physcam Autofocus for a personal test, and noticed they didn't install or run. Having lost the source code for the encrypted parts, all i could do was to patch fix the (very ugly, with hindsight) installer and individual script launchers. At least the autofocus routines still work in vray 3.0. Feel free to let me know of issues, but also know that without a complete rewrite (quite unlikely), the fixes won't be forthcoming. Updated for VRay 1.5 SP2. The installer from V. 1.4ss - SP2 onward now has an option to automatically add the scripts to a ctrl+shift+alt quadmenu. Notice it should append the scripts to whatever is already in the quadmenu (nothing, by default). Please report any odd behavior, or undesired effect: it's a first attempt at the code, and may contain issues. Anything to Physcam v.1.4: converts max standard cameras and viewports to VRay Physical Cameras, along with FoV animation.V.1.4 corrects a bug with camera views conversion, copies across clipping planes' ranges , and allows for individual camera naming at creation, rather than later by hand. Matrix-Weighted Exposimeter V. 1.21 : very similar in principle to that of dSLR, it allows for different weighting of each slice/square in which the image is divided, as well as allowing a different range of pixel brightnesses to be chosen for the exposure (akin to real world lens filters). Entirely customisable for behaviour.Now with auto-white balance and preset manager! From V. 1.16 it supports exposure / White Balance animation through the script. Please note this is not meant to be a frame by frame tool: doing so will result in flickering (like for standard dSLRs) and will likey lead to max crashes due to maxscript memory heap overload. Keep previews small, Nth frame at around 1 second, and go in and refine by hand activating "Auto Key" from the max interface and exposing the problematic areas. The Sample Rate calculator, new with 1.19, is an early attempt at DMC AA optimisation. It will render a sample pass with whatever DMC AA (ONLY!) settings you have, analise the sample rate, and guestimate a new threshold value (AA noise threshold only) so that the BIAS setting may be met (+- 2.5%). The BIAS indicates the pixel brightness average in the sample pass (where ~0 is min sampling, and ~1 is max sampling). V.1.21 fixes the inconsistencies in vray versions when using QMC (now brute force) as a method for exposure GI. Physcam Auto-Focus:Finds the closest object surface directly in front of the camera, and focuses the VRay Physical Camera to it. Added DoF Preview rendering (near-realtime) for Physical Cameras which have been created with the Physcam Converter Script (so physical cameras parented to, and overlapping perfectly, a standard one) . The function works only under Max2008, due to the fact that previos viewport grabbing methods would refresh the framebuffer before grabbing, losing the DoF effect. Implementation for earlier versions is possible and under study. A drawback of the new grabbing method, though, is that you'll have to have the current viewport (the one selected just before pressing the script button, any viewport will do.) free of dialog boxes and such, as the grab will read from video memory and grab those as well. For this reason, the script now pops up in the BOTTOM RIGHT CORNER of your screen, away from what's normally the camera view. Please note that the preview is NOT accurate as to the Physcam. It's just meant as a visual queue to understand where the camera has focused. VRay Realtime Sky V.1.01: Allows realtime update of the VRay sky in viewport, through any change of sun position or parameter. Changes the Sun intensity for DISPLAY ONLY, not at rendertime, to allow for sky visibility without a Physical camera exposure. IMPORTANT NOTE: it's strongly suggested to keep the Background Texture Size at something like 256 in the vieport driver preferences to obtain optimal realtime performance. If updates seem sluggish, slow, or impossible, that's what you want to change. Updated the to refresh the viewport as soon as it's activated, and changed the viewport-only multiplier to 0.02 to better reflect the default Physcam camera exposure for the new Vray Sun and Sky models. Unpack the rar file into a temp folder, and RUN (it's not an i-drop package. use "maxscript->run script") main_installer.ms. Check/uncheck what scripts you want installed, choose to deep-delete old files if you're on max 9 (useless in max 8), and press the install button. button, a quadmenu or a keyboard shortcut. Remember to save the UI configuration after you've done so, so to preserve the assignments on the next max run. The scripts are released as donationware: if you like them, and/or use them for a commercial production, make sure you get the "i'm feeling generous" mood going, and drop a symbolic donation at the provided email address on paypal. Submitted by patrick dyer on Sun, 2016-12-11 22:04. Hey Lele, any chance of updating this script so it works with max 2017 and V-ray 3.3 please? Submitted by stmalk on Fri, 2016-07-29 00:30. Vray Camera convert doesn't work in 2016 with 3.40 Vray. It gives you an error "not creatable"
"VRcam = VRayPhysicalCamera whiteBalance_preset:4 whiteBalance:white name:(VRcamName) isSelected:on"
Submitted by 3dwannab on Tue, 2014-10-14 13:56. Silly me. I got carried away. The lights were set as sky portals therefore greying out the intensity. 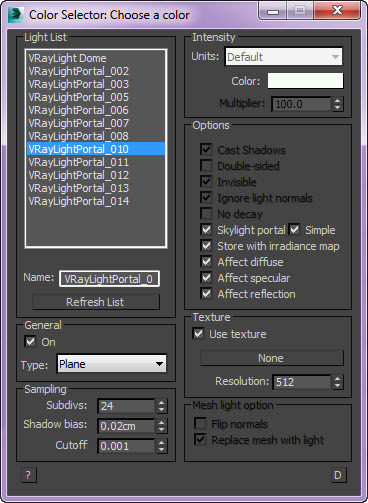 Skylight portal - when this option is on, the Color and Multiplier parameters are ignored; instead the light will take its intensity from the environment behind it. Submitted by MaximuM on Mon, 2014-10-13 23:01. I can't replicate that problem here with VRay Light Lister - v4.0 on Max design 2015. Maybe a fresh new install would solve your problem ? Submitted by 3dwannab on Mon, 2014-10-13 16:01. When run on multiple/selected lights it greys out the light intensity of each one. Does it make them references or something? Submitted by MaximuM on Wed, 2014-06-04 12:32. I have found a workaround: I manualy run the VRayLightMonkey.mse file located in the usermacro directory and it works. Submitted by Lele on Wed, 2014-06-04 11:38.
eh, I noticed, and can replicate it. Will look into it, for what's possible with the code i have left un-encrypted. Submitted by MaximuM on Fri, 2014-05-30 12:50. 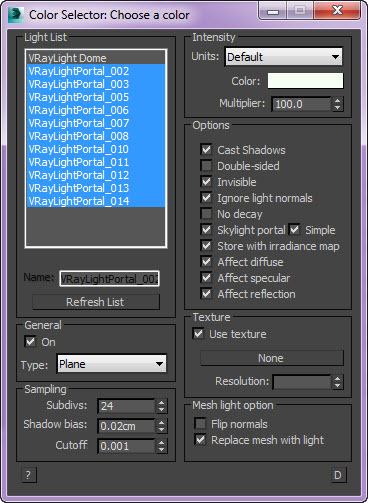 Thank you for the LightMonkey script, very usefull although it would be nice to have it work for regular 3dsmax lights too. I have a problem: even though I saved the UI using the "Save custom UI scheme" option, I have to run the installer each time I run 3dsmax otherwise I can no longer use your scripts (I created a toolbar for LightMonkey and it is greyed out). Any idea for what I have to do ? Submitted by segar on Wed, 2014-05-28 23:29. Submitted by Lele on Sat, 2014-03-15 08:19.
oh damn, if i noticed! Well, it was a three minutes job, so no worries, and thanks anyways!